It's rare to find a product that's almost impossible to fault. The Audeze Sine design isn't ostentatious, so if you want a pair of headphones that deliver the kind of audio you'd expect from top-of-the-line products, in a design that's subtle and considered, these are a perfect pair. Sound is completely customisable, too, plus there's just more of it because of the built-in amplifier and DAC. With Apple expected to ditch the 3.5mm jack, iPhone users will have two choices: either brave it in the world of wireless earphones, or find a Lightning connector-equipped set of cans. The Audeze Sine fits in the latter category. With industrial design taken from the BMW group's Designworks studio, and some innovative audio technology, your iPhone, iPod or iPad will have never had it better. If your device is not equipped with a Lightning connector, avert your eyes now. This review is not for you. Well, sort of: there's a 3.5mm cable in the box too, but you won't squeeze all the glorious audio out of these cans. First thing's first, the Sine cost £450. Yep, they're not budget by any means, so you'll need to wrap your brain around that before you can wrap the Sine around your ears. Still, as Audeze goes that's actually not too steep - which might sound mad, but that's the truth of it. With high-end headphones there can be a temptation for manufacturers to over-engineer products. With the Audeze Sine headphones, however, everything feels purposeful. It's not just a pretty pair of headphones to look at, all the hinges and movement is fluid and solid. The soft black leather combines with the angular and minimal aluminium frame to create a headphone that screams aesthetic quality, without being in-your-face about it. It's stylish and sleek, soft and comfortable to wear, yet durable and deliberate. Because there's no audio cabling inside the headphone unit itself, the headphones have been given complete freedom of movement. The earcups attach to the headband using a strong, but light, metal frame which has pivot-point half way down the side. This allows the cans to move nearly 45-degrees, while another point at the top means swivelling around 180-degrees is possible to lie the headphones flat when packing them away for transportation. As well as that, the arms (or forks) that hold the earcups to the headband are infinitely adjustable. There's no clicking system for incremental increases in headband length. It's all completely smooth and noiseless. Indeed, all movements afforded by the beautiful industrial design are that way. It's heavenly. Because this movement is so smooth, it fits on to your head very comfortably, but we did find that - although the headphones stayed on - they didn't feel as reassuringly tight as some other headphones out there (such as our V-Moda, which some might find too pinching by comparison). In many ways, it felt as if we weren't wearing the Sine at all, which is pretty wonderful. They can be worn for hours at a time without becoming tiring or overly warm. The earcups themselves have an ear-shaped, almost triangular design, meaning you can't wear them the wrong way around. The 3.5mm input jacks on each are recessed at an angle to ensure a solid connection, and to make it difficult for the cable to be yanked out accidentally. And with the cable being flat, it's almost impossible to get it tangled up. The Audeze Sine boast a couple of firsts. 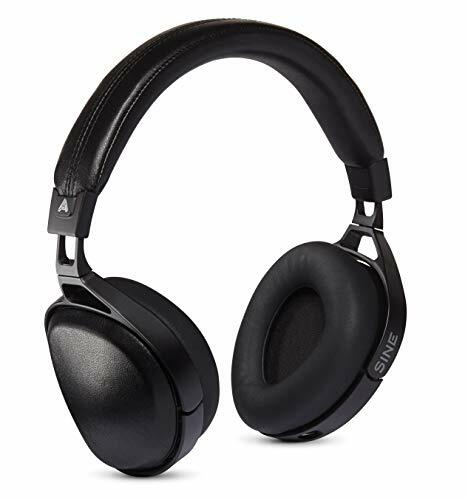 These are the first on-ear headphones to include planar magnetic technology. These are three times larger than typical on-ear drivers, giving you better quality audio with more bass. The diaphragms inside the earcups are super thin and almost weightless to ensure you get virtually no distortion. Regardless of which audio or tracks we listened to in our testing, there was no detectable hissing or buzzing of any kind. They also have a wide frequency response, which essentially means that it doesn't matter how low the bass or high the treble: you'll get the full spectrum of sound. The second first? Audeze has equipped the Sine with the first 24-bit Lightning cable, so-called the Cipher cable. So if you're an iPhone fan and are into hi-resolution audio, plus you want a great future-proof pair of headphones for when Apple gets rid of the 3.5mm jack, these could be ideal for you. The Cipher cable features an in-line system-on-a-chip (basically a mini computer) dedicated to delivering great sound from your iPhone. This inline SoC is built into the remote control/mic unit and features a DAC (digital audio converter) and DSP (digital signal processor) for high quality 24-bit hi-res audio, alongside a microphone and dedicated amplifier. In short - you've never had music sound so good from an iPhone (if you have the hi-res files to match, anyway). Perhaps the icing on the cake is that there's a dedicated 10-band equaliser app for iOS, which lets you fine-tune the audio balance. Even better, you can save two EQ presets, which are saved directly onto your Lightning cable/SoC, so that you can have your own preferred audio profile when you switch between devices - say iPad to iPhone. Very clever. The result of all this high-end technology is an audio experience that's practically unbelievable for a pair of on-ear headphones that cost under £500. The sound is full and well-rounded. And even though bass levels are notable, they don't overpower. It's the kind of quality that lets you get lost in the music. If you stream using lower-quality services like Spotify, Apple Music or Google Play Music, you'll still get a great sound. But to get the most from these headphones, we found that using Tidal's HiFi subscription and lossless audio quality was more refined, and less grainy. We suggest trying the same to see what you make of it - as not everyone is sold on the hi-res audio game. It's worth noting that the headphones do ship with a regular 3.5mm jack equipped cable as well. So you can use them with any device, but you will miss out on the bespoke DAC+amp goodness if you opt to use it. Which, depending on your source material and device, might be no biggie given the quality of these cans. The only issue we found - if you can even call it that - came down to personal preference: we'd like to have a more snug fit, but that would more than likely mean losing the completely smooth adjustment and floaty fit. Obviously the price point is a bit of a hurdle, but for top notch quality - whether normal or hi-res, using the Lightning connector or not - the Audeze Sine may well be the only over-ear headphones you'll ever need. And for that reason they're worth the investment.